For many of us, these extremes of eating has made thriving and surviving more difficult to do. So howwe be eating in a way that's classified as "normal" or balanced? 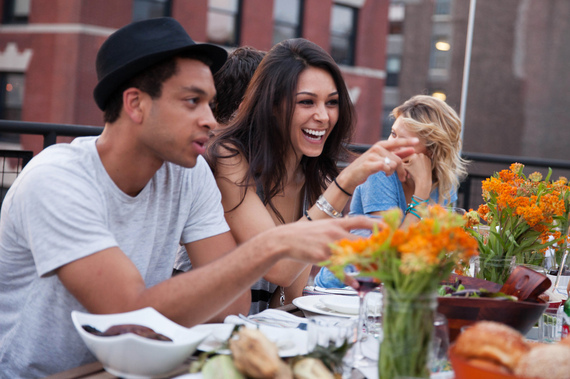 Well, for starters, here are five qualities that normal eaters DON'T have. Eating is something that's as essential as breathing oxygen to live. It's simple, but... not easy. When it comes to eating, it can be so easy to get caught up in extremes: crash dieting, intense cravings, compulsive eating, restricting, the Top 30 Weight-Loss foods You Must Eat, and then there's processed foods, which trigger our addictive tendencies and send them into overdrive. For many of us, these extremes of eating has made thriving and surviving more difficult to do. So how should we be eating in a way that's classified as "normal" or balanced? 1. Seeing food as "good" or "bad." Normal eaters just don't categorize foods in this way. They also don't eat to live or live to eat. They do both without leaning too much in either direction. For them, eating isn't a moral dilemma. It's just an essential, functional and pleasurable part of living. 2. Thinking about food all the time. You'll rarely find them obsessing about when they'll get their next hit of potato chips or cake -- they're too busy exploring, learning and enjoying every other aspect of life. Sure, they look forward to a delicious dinner with friends and family, but don't devote too much time to planning and thinking about their meals apart from executing the basic tasks of eating: Picking up their groceries, deciding which restaurant to go, which takeout place to try next or what time to cook. 3. Using food as a bargaining chip. They don't feel compelled to make up for "bad" eating behaviors like overeating by over-exercising, starving themselves, purging (by means of vomiting or taking laxatives, for example), restricting their food intake, or forcing themselves to adhere to even stricter diet "rules." 4. Turning to food for emotional comfort. Painful emotions, stress, anxiety and difficult situations rarely drive them to eat as a means of coping. Rather, they turn to healthier and more productive ways of dealing with the inevitable curve balls that life throws their way, such as talking things over with a friend, improving their mindfulness, and focusing on solutions that will help, not hurt their circumstances further. 5. Ignoring the effects food has on their health, happiness and fitness. They're aware that food is intertwined with all these three aspects of their lives, so if they want to improve on them, they work on tweaking what, how and when they eat. Normal eaters seek to understand how food affects their bodies and whenever possible, choose the options that will support the outcomes they're after, but don't stress out over getting things perfect. 6. Allowing food to disrupt their lives. They don't let food-induced fear and anxiety stop them from going to social events and parties, or spending time with the people they love. They also know that the occasional bout of overeating is normal and is no reason to spend the next two weeks obsessing about food. So what exactly does normal, healthy eating look like, exactly? Choosing foods that satisfy you. Paying attention to what you're eating and enjoying it. No longer eating when you're full and satisfied. And her definition of weight-loss success? Losing it and keeping it off.